A few days Back Oneplus team released the OxygenOS Open Beta 8 Nougat for the OnePlus 3 phone, now today they released the new updated version of OxygenOS Open Beta 9 Nougat for Oneplus 3. The new update comes with the lots of new fixes and runs on the Android Nougat. If you’ve already flashed a previous Open Beta 8 build, then you will receive this update via OTA. If you are not then you need to flash the Full ROM zip file on your phone and after that, you can enjoy the Android Nougat on your phone. Here in this guide, we will show you how to Download OxygenOS Open Beta 9 for OnePlus 3 and flash it manually. Please read the following instructions carefully before flashing your device. Flashing may lead to loss of data and damaged hardware if not, done properly. So make sure to take the full backup of your phone and save it in some safe place. 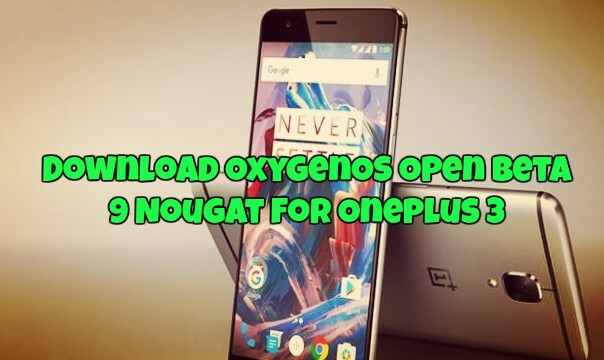 If you want to update your OnePlus to the latest version of Android Nougat then Download OxygenOS Open Beta 9 for OnePlus 3 from below. Check below what’s new in OxygenOS Open Beta 9. Download the file and follow the below mention instruction to flash the same on your oneplus 3 Phone. 2. Download the Open Beta 9 Full ROM zip from above and save the zip file on your phone internal memory.